Amazon has set the precedent for shipping methods, and now every consumer expects instant delivery, so how can online retailers meet these new consumer expectations? Shipsi is the frictionless solution that provides an “Instant Delivery” option that integrates into any existing websites checkout page. Shipsi partners with last-mile delivery networks, so consumers can receive their online orders in less than 60 minutes. This platform currently operates with delivery networks in 100+ major cities across the United States. 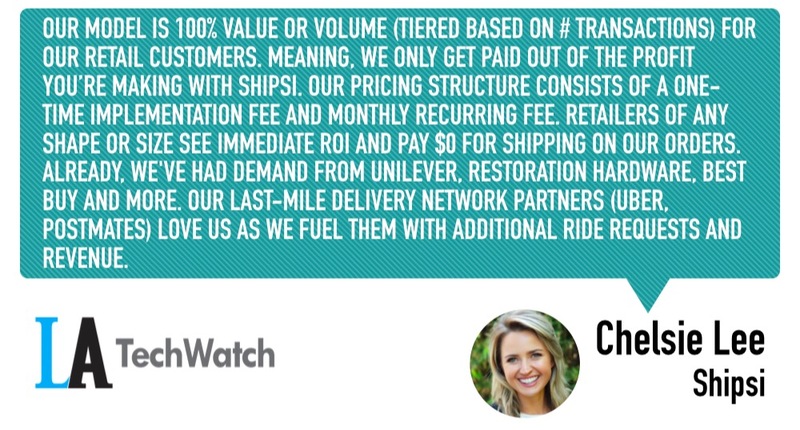 LA TechWatch sat down with cofounder and CEO Chelsie Lee about the experience of leading a company that’s making on demand a reality for online retailers and their customers as well as the company’s recent Seed funding. We recently closed a $1.9M Seed round fundraise, led by Mayra Tama at Initial Capital and Jesse Draper from Halogen Ventures. 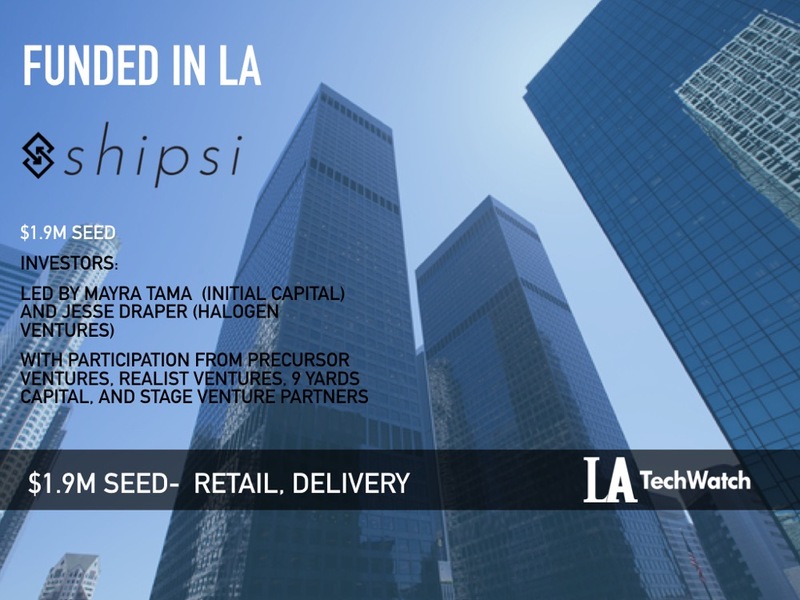 Additional investors include Precursor Ventures, Realist Ventures, 9 Yards Capital, Stage Venture Partners, and a handful of strategic angels. Tell us about the service that Shipsi offers. Shipsi’s technology is transforming the future of online retail by providing an “Instant Delivery” option on any existing website’s checkout page, where consumers can receive goods within just one hour. Natively built into any existing website, we aggregate multiple last-mile delivery networks to ensure the best price available for consumers. Our solution is a frictionless experience for consumers and an easy integration for any retailer with no need to change existing business systems. What inspired you to start Shipsi? It happened quite organically and likely derived from a relentless curiosity about what could be. As I looked through the data and insights of large retail brands I used to work with, I became increasingly frustrated with millions of potential customers walking out the door, just because they couldn’t get their goods fast enough. I couldn’t help but empathize – I constantly wondered why retail was making this so complicated and knew there was a way to make it simpler. I’ve also always been passionate about and fascinated by predictive analytics and recall the moment the light bulb went on for Shipsi. That same day I resigned from corporate America. Making our solution a no-brainer for any retailer to get started was key. We were determined to build a model that fueled value (and revenue) to everyone involved when we were in the equation. Keeping the consumer experience perfect was critical to us as well—and while white label integration with last-mile delivery partners requires substantial time and effort, we’ve seen that consumers enjoy shopping at the store they know and trust rather than going through a third-party app. In addition, our solution is specifically designed for retail; calculating very specific item data. This enables us to not only understand exactly what merchandise is available but also lets us align better with our last-mile partners for the proper type of transportation required (so that you never match a couch delivery with, say, a bike). What market is Shipsi targeting and how big is it? We’re a perfect fit for any retailer who ships physical goods to their customers but knows that in order to stay relevant, they have to start competing with Amazon on same-day shipping. Our specialty is leveling the instant shipping playing field for retailers in a surprisingly affordable way (due to our using last-mile companies). Whether it’s an online store or brick and mortar, we can connect both systems together—opening up more distribution and empowering them with omnichannel capabilities upon going live. Our model is 100% value or volume (tiered based on # transactions) for our retail customers. Meaning, we only get paid out of the profit you’re making with Shipsi. Our pricing structure consists of a one-time implementation fee and a monthly recurring fee. Retailers of any shape or size see immediate ROI and pay $0 for shipping on our orders. Already, we’ve had demand from Unilever, Restoration Hardware, Best Buy and more. Our last-mile delivery network partners (Uber, Postmates) love us as we fuel them with additional ride requests and revenue. What sort of outcomes can you share with us regarding some of your clients that have incorporated Shipsi into their website? One of our clients, Create the Edit, recently sent us an excited email saying, “We’ve doubled our revenue since using Shipsi.” Many others are experiencing massive conversion boosts at checkout, increased customer satisfaction, and lower shipping costs (since it’s all driven by last-mile). Our current partners include Shopify, Postmates, Uber, Salesforce among others. We are thrilled to be live and operating with access to 100+ major cities across the US. We’ve seen great success with every retail client we’ve brought on board. A few to mention are Create the Edit, Mini Dreamers, and No Rest for Bridget. Knowing I absolutely have THE team and product to take on the world and unsure when I would have the resources to properly support them. I also often thought about so many brands, and even specific individuals, I enjoyed working with so much in the past. They and the rest of retail are counting on us! Good question. I’ll ask. My immediate reaction is because they are smart. What are the milestones do you plan to achieve in the next six months? Our main objective is national expansion and getting a number of household names onto the platform. Stop. Take a breath, button yourself up, go get partners, customers, and the rest and they’ll come. Also, LISTEN. What reason do they have to give a damn? Personally? Professionally? There is a heap of reasons for them not to invest. Why did they take the meeting? Heard good things about your team? Product? Something else? PS– Simplify your pitch and make it understandable for any 80-year-old walking down the street. Stop vomiting your idea on them, do your homework and don’t take a meeting unless there is an immediate opportunity… worry about later funding later. You need cash now. Go do it. Once you close, pretend like you didn’t and you’re still broke. Don’t listen to everyone trying to tell you where to spend the money now that you have it. Don’t be dumb. Follow your gut. It got you this far—keep relying on it. For founders- no need for 60-minute meetings. Time is priceless, I stick with a rule of always commit to a drink (or coffee) and never commit to dinner. Saving time (and money) for both parties. Now: Expanding the team and diligently working to continuously refine and improve our internal process, support, and product. Longterm: Not only be the leader in on-demand retail but to be the leading source for predictive on-demand data with an extensive and massive network. The Tasting Kitchen, Shutters (for nostalgic reasons) or Little Sister.